Nicholas Hellmuth comments on the Vytek F/X laser engraving system and other CO2 laser engravers from Trotec, GCC, Universal, Epilog, etc. Vytek F/X CO2 laser engraving system. 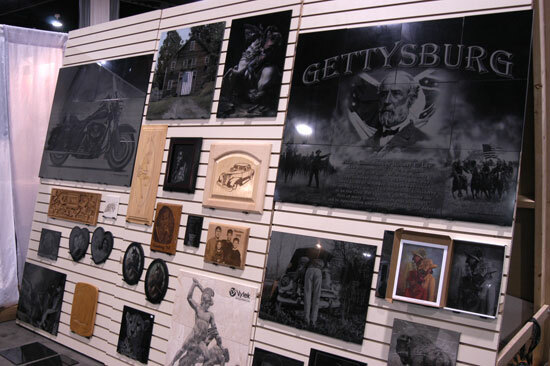 At digital imaging and sign printing trade shows the laser engravers that tend to be exhibited are from Epilog Laser, Universal Lasers and sometimes Trotec. 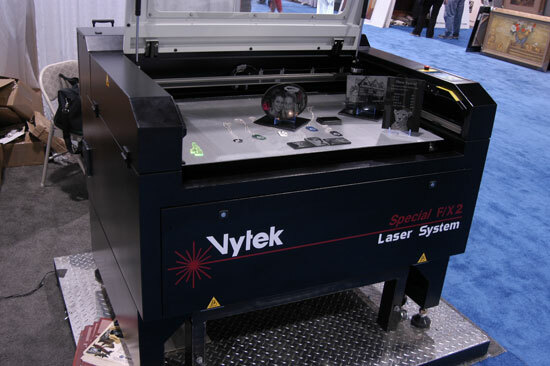 At SGIA 2006 for the first time I noticed Vytek and their FX laser cutting and laser engraving systems. The quality and diversity of the resulting engraved materials was notable. 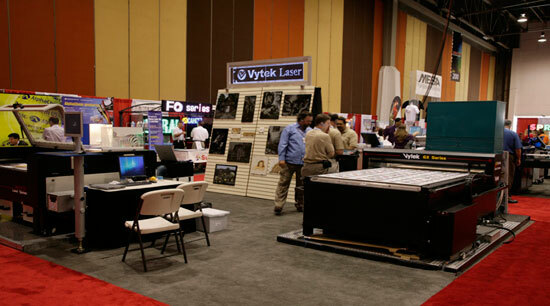 Vytek laser engraver, at Art Expo Atlanta 2005. But I know GCC LaserPro better since I have spent several days in the world headquarters of GCC in Taipai, Taiwan. Plus I know the GCC UV-cured flatbed inkjet printers, such as the StellarJET 183UV. Since the background of FLAAR is with fine art photography and fine art giclee the larger size of the Vytek laser appeals to me. And since my prior background is with archaeology, especially 4th-9th century stone sculpture of Maya and related pre-Columbian civilizations of Mexico, Guatemala, Belize, and Honduras, I am all the more interested in a large sized laser engraving system that can work on stone (or on tiles). 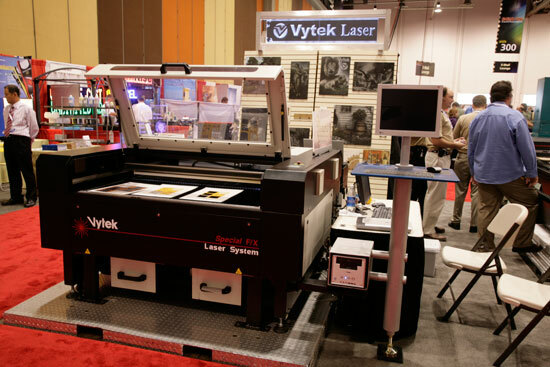 VyTek machines come in three series: L-Star Series laser etching system such as the LST610, the FX cutting and engraving system, and the FX2 (41 x 48”). Since the Vytek is rather large I naturally have more experience on the smaller CO2 laser engravers. In 2006 the FLAAR test lab had a Universal M-300 and a Trotec Speedy 300. This Trotec is 50% more powerful than the Universal, and slightly larger. However the Universal CO2 laser engraver worked more precisely than the Trotec (but this was because the Trotec that was loaned for evaluation was a used model that had seemingly been bounced around too many trade shows before it arrived at our university for testing). Vytek F/X laser engraving system. Printing examples of Vytek laser engraver. First posted Oct 9, 2006.